“I don’t want to have to strip my way through school,” said anthropology and environmental geography student Adrianna Deciccio. Although some might consider these words a bit extreme, Deccicio clearly expressed the frustration that the other 896 students felt when they congregated on the Reggie’s terrace under rain and snow yesterday afternoon for the CSU’s special general meeting. 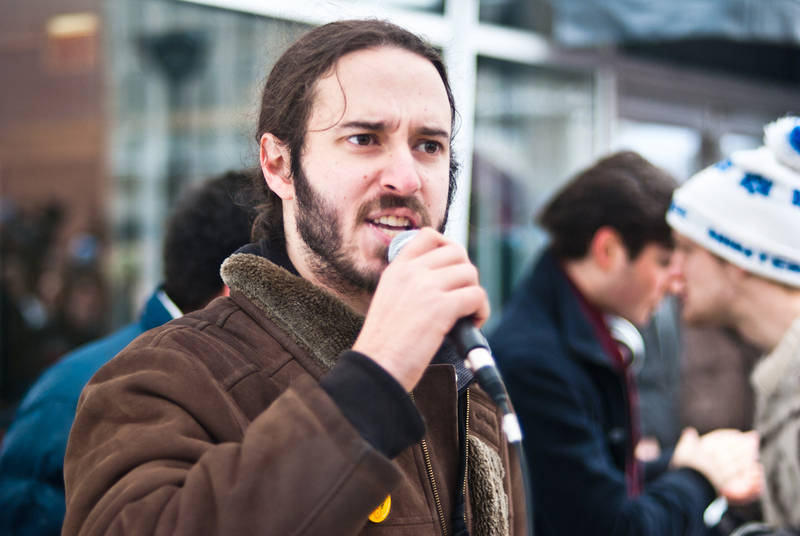 Apart from voting on motions and denouncing Concordia’s Board of Governors for lack of transparency, the students were marking a special day of action against the Quebec government’s imminent tuition hikes. 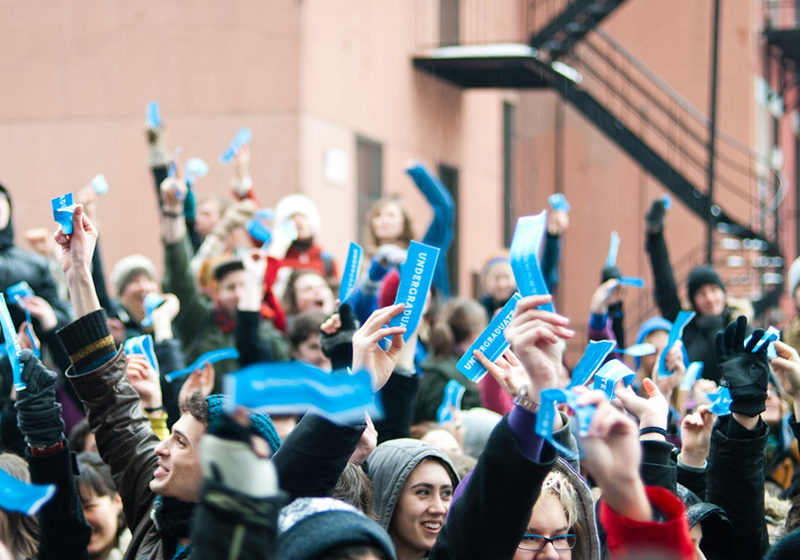 The event was titled WHALE: Wintry Hot Accessible Love-in for Education. 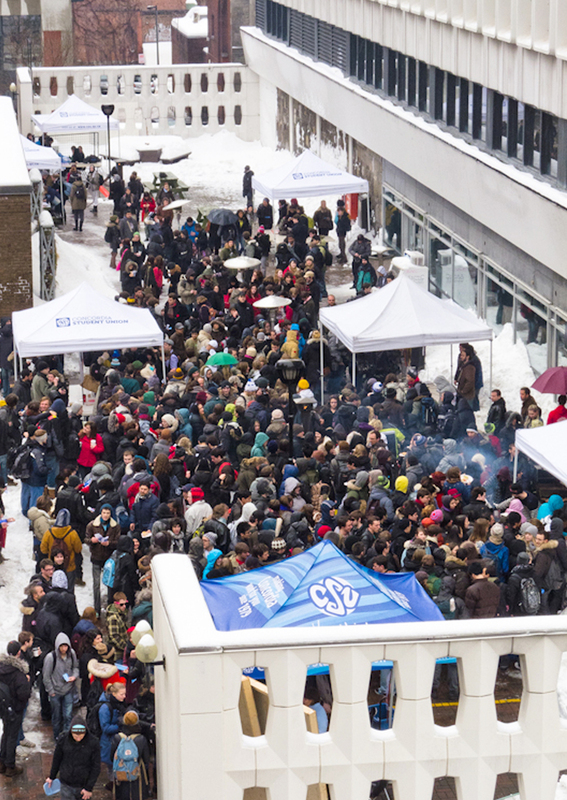 Under the watchful eye of Montreal police and campus security, close to 400 students participated in a march through the street surrounding the SGW campus, chanting “Hell no, we won’t pay, for someone else’s severance pay.” They then proceeded into the EV building and marched through the campus’ underground tunnels, making their way up to the Hall building’s seventh floor. Once back on the terrace, students could sign a Valentine’s Day card to the BoG, as well as a petition asking all members of the Board to resign. About 50 people from various student groups and programs facilitated the day’s activities. For biology student Irmak Bahar, who had originally proposed the SGM idea at the CSU’s informational general meeting on Jan. 27, the day of action was nothing short of a success. It is a possibility that more SGMs will be held in the future, now that the quorum required for such an event has been lowered from 2.5 per cent of the CSU’s membership to 1.5 per cent. “I think the greatest things about lowering quorum are that it is not such a daunting task to facilitate an SGM anymore, we can now work towards a more direct-democracy scenario at the CSU, and of course, we could actually host a meeting inside on campus now,” said the CSU’s VP sustainability and promotions Morgan Pudwell, another of the event’s key organizers. This is good news for People’s Campus Coalition member Alex Matak, who felt that student apathy at Concordia had been dealt a serious blow yesterday by WHALE. Students plan to hold a second day of action this Thursday during the Board of Governors’ monthly meeting.